At Visium Resources, our focus is on providing your company with professional support staff solutions that meet your business needs. Our support candidates can improve corporate culture, increase employee retention and ultimately reduce your company’s bottom line. As an acclaimed industry leader in business solutions, we are extremely skilled at matching top candidates with positions that highlight their skills and talents in order to meet your business goals. 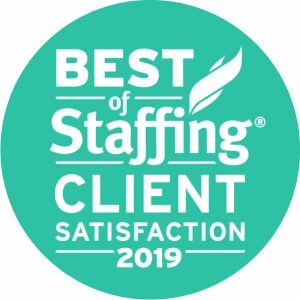 As a winner of the 2019 Best of Staffing Award, we continuously try to put our clients first. Let us help you! Find out why we are Orlando's choice for staffing solutions. Visium believes that a solid support staff is the building block for any company’s success. For this reason, we ensure that our support staff meets or exceeds the same rigorous standards of excellence that our clients deserve. Through the years, our clients have enjoyed success from our recruitment process. We have been able to replicate these strengths to place a large range of support roles for your business. .
Visium Resources realizes that skill set is not the only important aspect when searching for support staff. By relying on our complete knowledge of our clients operations, our talented recruiting staff makes sure that every professional candidate is a perfect fit. They do this by initially interviewing each candidate either in person or through the use of our proprietary video interviewing system. Ready for your business solutions? Contact Visium today in order to see how we can help find the solutions to all your support staffing needs!